For other people named Christian Meier, see Christian Meier (disambiguation). 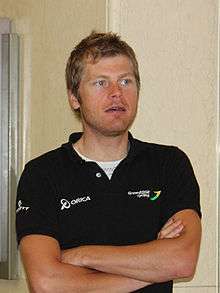 Christian Meier (born February 21, 1985) is a Canadian racing cyclist who rides for UCI ProTeam Orica–BikeExchange. Meier has also previously ridden for team Symmetrics, Garmin–Chipotle–H30 and UnitedHealthcare. Born in Sussex, New Brunswick, Meier is descended from German restaurateurs who settled outside Sussex, Canada and he attended Sussex Regional High School. His brother Michael succumbed to cancer in 2010. He raced for GreenEDGE in 2012, competing in the Giro d'Italia in May, 2012 with his best showing on Day 11 in 15th place. In March 2015 Christian together with his wife Amber opened La Fabrica Girona, a coffee shop in their European home of Girona, Spain. ↑ "GreenEdge adds Impey, Meier". Cycling News. Future Publishing Limited. October 11, 2011. Retrieved January 1, 2012. ↑ "Orica-GreenEDGE (OGE) - AUS". UCI World Tour. Union Cycliste Internationale. Retrieved January 3, 2014. ↑ "Karol-Ann Canuel, Hugo Houle Earn First Canadian Time Trial Titles". 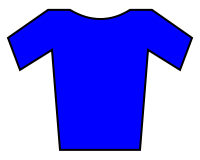 Cycling Canada Cyclisme. 25 June 2015. Retrieved 8 October 2015. ↑ Jones, Rob (27 June 2015). "Boivin wins Canadian road race title". cyclingnews.com. Retrieved 30 September 2016.